...but, not all of them. There's probably enough quality here to qualify a really fun EP, like the Motörhead fueled title cut which busts out into the total old school evil tremolo picked chorus, or "Nuclear Outbreak" which is a mashup of Repulsion and Hellhammer chord structures; even "Legions of Doom" which had already appeared on the 7" the year before, which along with a few other cuts sounds like a lighter contemporary Bolt Thrower for those belligerent melodies it hurls at you. The tone here is incredibly clean and crunchy, first impression is that it's very 'Swedish' but I definitely think it doesn't choke up enough gravedirt like the classic Entombed/Carnage style. Heavy and chest-pounding, with plenty of bluesy hard rock solo flair to the leads, though I'd say those are probably a little too sparse on the record and should have been doubled up to give the songs a more compelling, infectious edge to them. For instance, the solo/bridge to the tune "Mutilator" is awesome and you just aren't getting enough moments like that. Otherwise, the rhythm section is tight as a vice, still with loads of double bass pounding married to grainy bass guitar lines, again with a rich level of polish thanks to that polish and production. Robban Karlsson sounds as forceful and brutal as ever, but there's very little variation to his delivery here, so essentially after hearing 1-2 lines of any given track you've already heard the whole entirety, chorus parts included..."Zombie God" teased a more vicious and evil timbre which doesn't dominate over this selection, and after 12 cuts and 45 minutes, it had well worn out its welcome. And that's sort of the biggest setback Dedicated to the Flesh faces...it's just so goddamn repetitive, not just in terms of its own riffing choices, but to hundreds if not thousands of records to come before it. Lyrically and musically it doesn't take on the subjects of mangling, murder and undead mayhem with any individuality, just a collection of genre tropes that are breastfed by the same aspirations you find in most lowest common denominator death metal. I mean these lyrics look like they read a handful of Mortician/Cannibal Corpse tunes, cut & pasted a couple lines and called it a day. 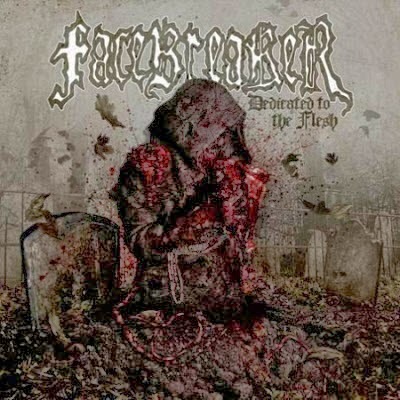 Not that Facebreaker has ever been original, or that they ever NEED to be, but there's just not a lot of progression of ideas between 2004 and this disc almost a decade later, no nuances or intricacies or distinctive traits that should have me picking this off the shelf at the record shop rather than just going home and listening to The Bleeding, or any of the Bloodbath albums which cover these themes and riffing techniques so, so much more explosively and memorably. Aesthetically, this looks and sounds good, but more than half the tunes should have been left on the cutting room floor, or gestated further to the point where they had some compelling riffs and ideas, rather than just settling for whatever.